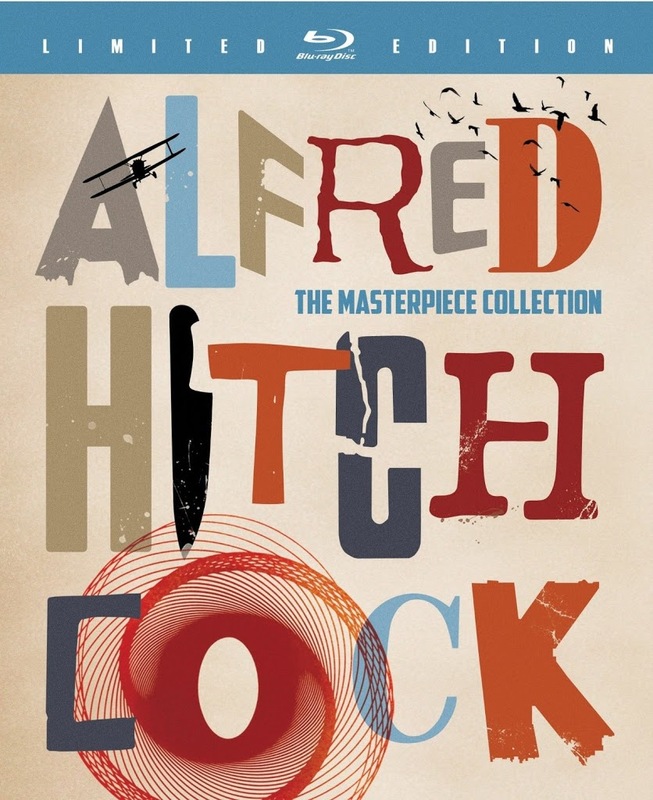 Surely on the wish list of many classic cinema buffs this holiday season is Universal’s 15-disc behemoth Alfred Hitchcock: The Masterpiece Collection. 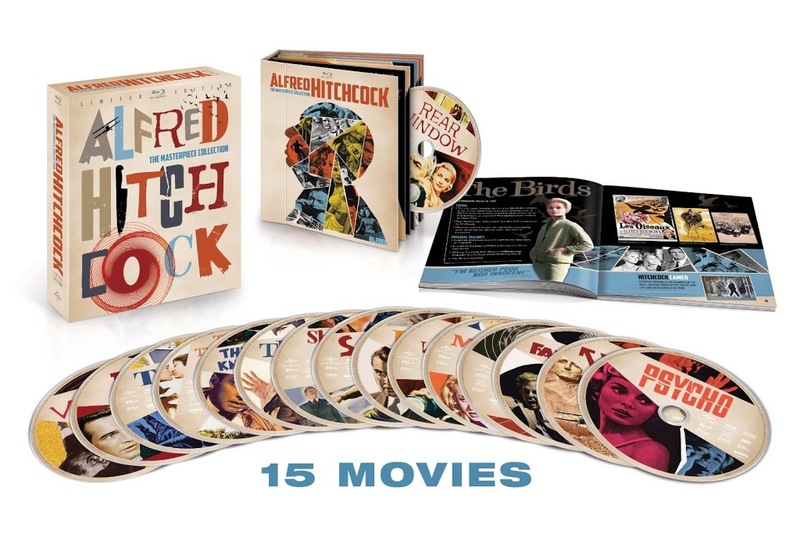 This Blu-ray set presents 15 Hitchcock films, 13 of which are in high definition for the very first time. Let’s hope it’s not the last time, as most of the transfers leave something to be desired. Before you (or someone you care about) plops down anywhere near the $299.98 retail prices for this box set, please consider the rampant quality control issues that unfortunately plague it. The content itself is beyond reproach. Some have already complained there are “missing” Hitchcock masterpieces. Of course there are, because these are only the films that Universal has distribution rights to. In fact the only reason North by Northwest(1959) is included on the U.S. set is due to Universal having managed to license the title from Warner Bros., who released the title on Blu-ray in 2009. So yes there are plenty of Hitchcock classics nowhere to be found on this set. Furthermore, several of the titles that are included aren’t really “masterpieces,” per se, but each of these films is essential for any serious collector of The Master of Suspense. This is basically a Blu-ray reissue of the 14-film DVD set of the same name released in 2005. Of the biggies assembled here, we have the aforementioned Northwest and the other previously available Blu-ray, Psycho (1960). We also get Rear Window (1954), Vertigo (1958), and The Birds(1963). All of these titles are justifiably among Hitchcock’s most popular and revered works. None of Universal’s visual presentations are on par with Northwest, which is the cleanest, sharpest-looking film in the set (which is merely a recycling of a 2009 standalone Warner Bros. Blu-ray release). Windowand Vertigo are among the better transfers, especially the vivid colors of the former. Both are marred by source print flaws, something that affects nearly every film in the set to some degree. The Birds was probably a very tricky film to restore, due to the prevalence of optical effects inherent in the original negative. It’s certainly passable on Blu-ray, with the outdoor shots looking quite remarkable. Of the remaining ten titles, favorite will of course vary from person to person. I’m partial to the real-time tension of Rope (1948), with its thought-provoking screenplay and effective performances by leads John Dall, Farley Granger, and James Stewart. This is the earliest color film here and the transfer is disappointingly soft. The black-and-white of the two earliest films, Saboteur (1942) and Shadow of a Doubt (1943), looks outstanding. Both films are interesting and often overlooked in the Hitchcock filmography, with Shadow being a particularly subtle drama. Marnie (1964), starring Sean Connery, was for years considered one of Hitch’s weakest films, but the character study has rightly undergone a serious reevaluation in recent years. Sadly, it wasn’t treated to a very careful transfer and the excessively heavy grain creates one eyesore of a Blu-ray. Frenzy(1972), a uniquely “modern”-feeling thriller, sits somewhat uncomfortably at the other end of the grain spectrum. This one appears to have been buffed smooth with a little too much DNR (digital noise reduction). Of the more minor Hitchcock titles, the mixed bag-visuals continue in earnest. The Trouble with Harry (1955) is one of the finest transfers in the set and one of the few I would use the word “gorgeous” to describe. This light comedic excursion (with a fun debut performance by the great Shirley MacLaine) boasts breathtaking detail and brilliance of color. Torn Curtain(1966) – notable primarily for its star turn by Paul Newman – and the overlong Topaz (1969) have drab visual presentations that don’t improve significantly on their standard DVD counterparts. But they look practically like Criterion Collection-level restorations when compared to the disastrous The Man Who Knew Too Much(1956) and Family Plot (1976). The former is a remake of the much better-regarded 1934 film of the same name (can’t wait for the Criterion release of that in Jan. ’13) and it looks pretty miserable. The print flaws – white and black specs, scratches, and other artifacts – that affect most of these films are epidemic on Too Much. Plot is Hitchcock’s final film and rarely, if ever, considered essential. But that’s no excuse for the grainy, near-pixilated at times, muddy, dark mess of a transfer that Universal has unceremoniously granted it. The audio is, thankfully, far more consistent. The 5.1 Dolby TrueHD mix on Northwest is, like its transfer, impeccable (kudos to Warner for their handling of this film). Both Psycho and Vertigo have very effective 5.1 DTS-HD MA mixes. All the rest have 2.0 DTS-HD mono tracks that boast clear dialogue with well-balanced music and effects. For the most part, these tracks are free of hiss, pops, or distortion. Rope stands out as having some minor issues with inconsistent volume levels, but nothing too distracting. Extra material is a straight port from the old DVDs. Don’t get too excited over the one Blu-ray exclusive, a featurette on The Birds called “Hitchcock’s Monster Movie.” This is basically a tie-in promo for Universal’s Classic Monsters Blu-ray collection, as well as other Universal-distributed horror titles. The recycled stuff was very well-produced to begin with, so it’s very good they are included. At the very least, each film contains a “making of” featurette that runs a half-hour or longer. Several titles, including Psycho, Northwest, Birds, Vertigo, and Rear Window have far more extensive supplements. But if you already own the DVDs, you’re not getting anything new. That’s disappointing, especially when coupled with the mixed-to-poor video transfers. If there wasn’t already enough to caution consumers, know that the packaging is a nightmare for anyone who doesn’t like touching a disc’s surface and sliding them in and out of cardboard sleeves. Inside the main box is a “book” made up of pockets that house the discs. While not excessively tight-fitting, pulling the discs out (and then replacing them) necessitates touching the playing surface and will inevitably lead to fine scratches as well. As evidenced by other releases, there are ways around this while still making a multi-disc set compact and more lightweight than including 15 standard Blu-ray keepcases. For the price Universal is asking, these alternatives should have been explored in order to make a more durable package that wouldn’t be harsh on the disc themselves. If you find you absolutely need to have this set, definitely shop around for the best price (if you’re U.S.-based and have access to Costco, they are currently selling it for $163.99). The U.K. version (which doesn’t have North by Northwest but is otherwise the same and region-free, meaning it will play in U.S. players) is currently selling Amazon UK for 92.5 pounds, which converts to about $146. Even with shipping, that’s a steal compared to Amazon US, which is asking $210 as I type this.